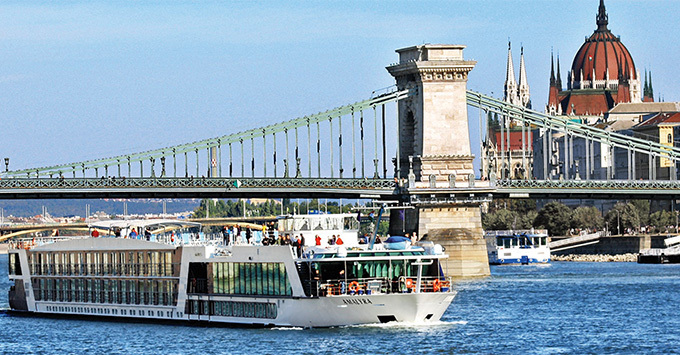 (11:12 a.m. EDT) -- AmaWaterways is expanding its wellness program, which was tested on one river cruise ship earlier this year, to five other vessels in the fleet in 2018. Select sailings on the six ships will be designated wellness cruises. The program, which is led by a wellness host, includes onboard morning stretches, jogging, yoga, cardio/core strengthening, resistance band classes and circuit training. Discussion groups are held on healthy eating and relaxation, and passengers booking a wellness sailing will be encouraged to pack a bathing suit, comfortable exercise clothes and appropriate shoes. All exercise equipment is provided onboard, as well as bikes, helmets and Nordic walking sticks. Besides the exercise and relaxation focus, the wellness program will have healthy food options at breakfast, lunch and dinner. Passengers will have access to hydration stations, breakfast vitamin shots, fresh fish, cage-free eggs and crate-free pork along with gluten-free, low-sodium and vegetarian options. The program debuted on AmaLyra earlier this year and will be added to AmaCerto, AmaPrima, AmaSonata, AmaDante and AmaDolce. An early proponent of active river cruising, AmaWaterways was the first river cruise line to add bikes onboard, a move that has been replicated throughout the industry. The line also offers a choice of active excursions in ports, including hiking. "Staying active has always been an important part of my lifestyle and it has become essential to so many of our guests, as well, who are looking for ways to remain healthy during their travels," said Kristin Karst, executive vice president and co-owner of AmaWaterways. "We have seen an increasing demand for healthy, active options and we're excited to be able to offer our new program on six of our 20 ships next year."